Ocracoke Island’s Blackbeard’s Pirate Jamboree expanded to 4-day event for 300th Anniversary. Join us Oct. 25 to 28 for living history exhibits, ship battles, sword fights, historical talks, rowdy songs, food, drinks and more! 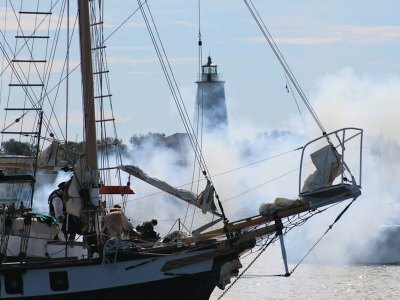 Chart your course for the Ocracoke Blackbeard’s Pirate Jamboree to commemorate the 300th Anniversary of Blackbeard’s historic last battle directly off the shores of Ocracoke Island. From October 25 –28, 2018, step back in time with the sights and sounds of 17th- and 18th-century pirate life as Ocracoke Island comes alive with pirate reenactment crews as they invade by land and sea. 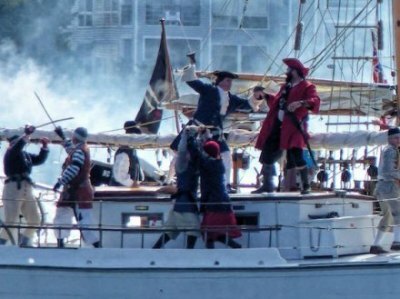 The whole family can enjoy musical entertainment, magic shows, living-history exhibits, period encampments, food and craft vendors and a live three-ship battle with cannons on Silver Lake. The event is free to attend, except for a few ticketed events. This year’s event, sponsored by the Ocracoke Civic & Business Association, is expanded to four days, starting Thursday evening through lunch on Sunday. The event kicks off Thursday night at the Berkley Barn with a lecture by historian and researcher Kevin Duffus discussing “Was Blackbeard Really Murdered?”, rollicking tunes from pirate band the Motley Tones, and delicious hors d’oeuvres, beer & wine and dessert. Tickets for “A Historically Fun Evening with Kevin Duffus and the Motley Tones” can be purchased online or at the door. Named Historian of the Year in 2014 by the North Carolina Society of Historians, Duffus has done extensive research with primary sources over many decades to discover the true origins of the man called Blackbeard, detailed in his book“The Last Days of Black Beard the Pirate.” Duffus’s talk will focus on the political motivations back then. Among the weekend activities include Brigand’s Bazaar vendor fair, featuring over 25 regional arts & crafts vendors. Find succulent victuals from local and regional purveyors including local eateries and breweries at the food court; street mistrals singing seafaring tavern songs, sword fight demonstrations, pirate magic shows and skits, merchandise commemorating this special year and an expanded living history encampment on the Berkley Manor grounds. These historically accurate camps teach about the 17th- and 18th-century maritime heritage, from navigation, weaving and cooking to ship board medicine and hygiene. The centerpiece event Saturday afternoon at 2 p.m. in Ocracoke’s Silver Lake harbor will recreate Blackbeard and Maynard’s three-ship battle. The Jamboree will conclude with the memorial to both Blackbeard’s and Maynard’s crews Sunday morning at 10 with a march from Blackbeard’s Lodge to the beach at Springer’s Point. Lunch with the Pirates will follow at noon in OcracokeOyster Company. A brief schedule is below, and a detailed program of events is available on the island in the Blackbeard’s Pirate Jamboree Program and online at www.visitocracokenc.com. 3 pm to 2 am: Ocracoke Bar & Grille: "Blackbeard's Kill Devil Rum Garden"
11am: The Kings Rangers Muster! Drills: Pike, Cutlass and Long Gun: Cannons fire as we kick off a great festival at the King’s Rangers encampment Wahab House dockside! 2:30 pm: Tom Mason and the Blue Buccaneers. A wild band of Nashville musicians who dress like pirates and play a rollicking mix of piratical sing-alongs, rave-ups, rock and more. 3 pm to 2 am: Ocracoke Bar & Grille: "Blackbeard's Kill Devil Rum Garden" plus Pirate duo Crossjacks, 8 pm3:30 pm: The Pirates invade the encampment! $5 per person. Non-alcoholic refreshments. Blackbeard but only one them is the real notorious pirate while the other two are imposters? 8 pm: Ocracoke Oyster Co.: Tom Mason & the Blue Buccaneers. A wild band of Nashville musicians who dress like pirates and play a rollicking mix of piratical sing-alongs, rave-ups, rock and more. 11 am: Meet Black Beard! 4:30 pm: Tom Mason and the Blue Buccaneers. A wild band of Nashville musicians who dress like pirates and play a rollicking mix of piratical sing-alongs, rave-ups, rock and more. 8 pm Bawdy Beer Garden, sponsored by 1718 Brewing Ocracoke. A vivacious and informal round-robin exchange of bawdy songs that date back hundreds of years is sure to make you blush. Refreshments. 8 pm Ocracoke Alive: A Tale of Blackbeard musical, Ocracoke School gym. $15 Adults, $7 Kids. Tickets at the door or online at http://www.ocracokealive.org. 10 am Springer’s Point Memorial Service for those killed in Blackbeard’s Last Battle. Join with us as the Pirate andMilitia Crews march to beautiful Springer’s Point to honor those who perished on that fateful day, Nov. 22, 1718. TheMilitia’s cannons will kick off the march at Blackbeard’s Lodge. Join in at any point along the route. Noon - Ocracoke Oyster Co.: Lunch with the Pirates. Join us in closing out the festival at a rousing brunch with the Pirates. Your chance to sit down with our Pirate Crews and enjoy a great meal. Ocracoke’s Jamboree is part of the N.C. Department of Cultural Resources promotions this 300th anniversary year. The Hyde County Tram System will also operate throughout the Jamboree weekend from 10 am – 9 pm, taking visitors around to tram stops throughout the village. For details about Ocracoke’s Jamboree, visit the events page at www.visitocracokenc.com. Like us on Facebook for more updates: https://www.facebook.com/BlackbeardsPirateJamboree. Get your official 300th Anniversary Blackbeard’s Pirate Jamboree merchandise in our online store. Items include T-Shirts, Moscow Mule Barrel Mugs, and Tank Tops. If you are not an OCBA member, you can check out as a guest. To purchase, please visit business.visitocracokenc.com/store/. To learn about all that’s going on celebrating Blackbeard statewide, visit the website www.ncdcr.gov/bb300.